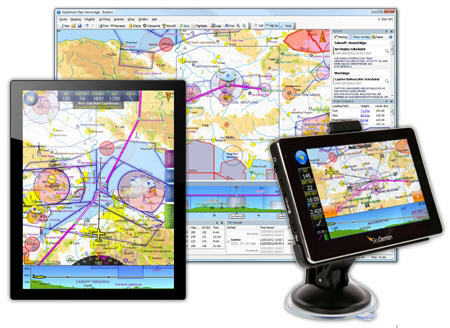 HeliPoland promotes SkyDemon for pilots everyday use as a great multifunction support. SkyDemon custom-built vector charts are the clearest you will find, easily adjustable to your preferences and presented in a familiar style. Route planning is as simple as clicking or touching waypoints, with clear spacial information about your route shown with Virtual Radar. Warnings for potential incursions into controlled, dangerous or temporary airspace help you form a mental picture of how your journey will unfold. View the latest TAF and METAR bulletins as you plan, and the effect the forecast winds aloft will have on your route. A full NOTAM briefing helps you keep aware of temporary situations, and world-class graphical NOTAM depiction means they are intuitively depicted on your chart. Weight, balance and fuel calculations are performed in real time as you plan. Access a huge repository of airfield documents from the national AIPs across Europe and from many third-party suppliers. Take advantage of our social features to share and view fuel prices at airfields in real time. Take your planned route to the skies with the press of a button. Print enroute charts, a Pilot Log and other briefing data to create a perfect route kit. File a VFR flightplan or UK GAR form in seconds. While flying, SkyDemon will present you with a moving map of unparalleled clarity, with a wealth of extra information available at a touch of the screen. Load a route you have planned earlier or plan one on the fly by simply touching the map. Virtual Radar draws your path ahead with stunning clarity, making it obvious what sort of airspace, obstructions, NOTAM and terrain are ahead and how they relate to your trajectory. You’ll have the latest TAF, METAR, NOTAM and wind forecasts loaded for reference in flight, and some devices can even update this data while aloft. If you change your planned route while airborne you can still obtain a NOTAM briefing to ensure your new route is safe, even without an internet connection. Navigate enroute using the map, direction indicator or with an HSI. Use the extended centreline guidance to align early at your destination and optionally use our pseudo-ILS instrument for extra guidance. View administrative and approach information for any airfield at any time. Georeferenced airfield plates provide rich local maps and clear airfield layout diagrams, seamlessly integrated into the enroute chart. After your flight, review your track log with the powerful log analysis feature.